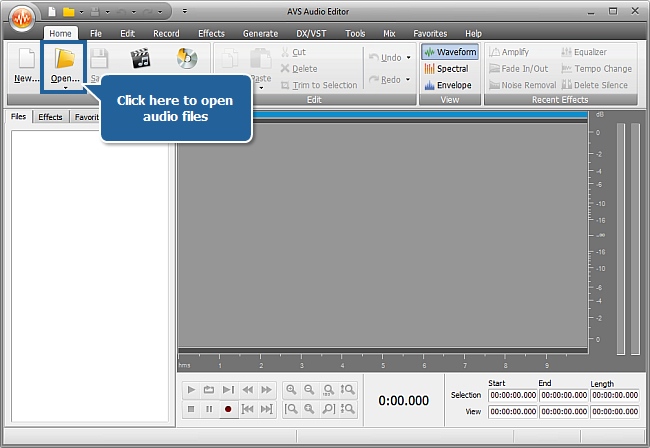 How to make your audio fit the size of a media file with AVS Audio Editor? You'd like to add some background music to your slideshow or home video, but the audio track you need does not cover the whole of your visual file. 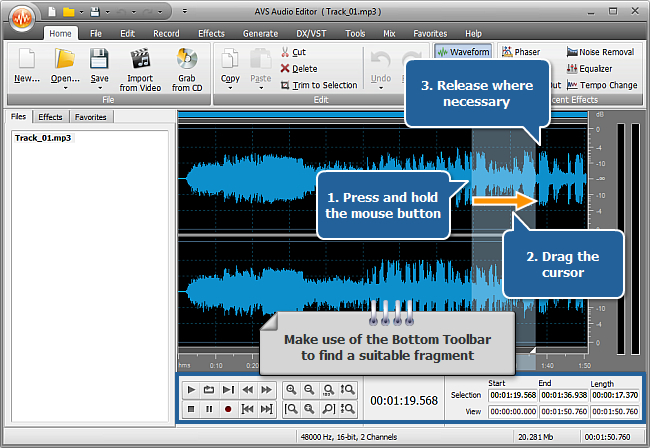 AVS Audio Editor will help you to solve this problem. You can make your audio file longer without any quality loss by adding suitable fragments to the track. Follow these steps to see how to do it. To open an audio file that you'd like to use as background music for your presentation or home video click the Open button on the Home tab of the Ribbon Command Bar. 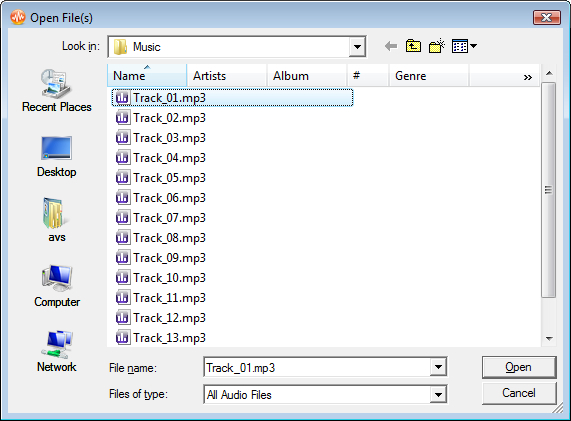 Select a fragment that will fit the end of the file best, for example, the last moments of the track or its refrain. 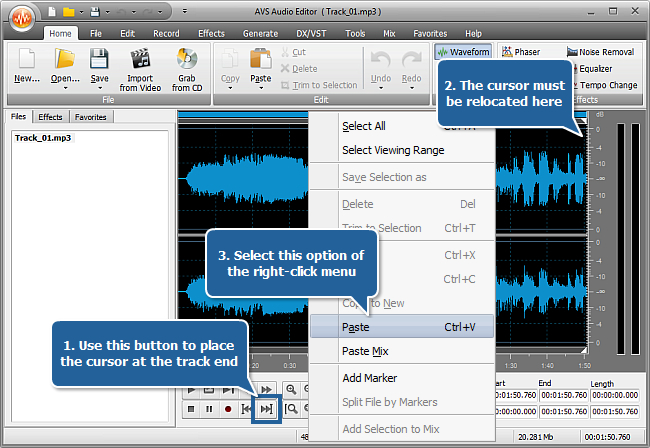 To choose this part with more precision use the Bottom Toolbar options (in particular the Audio Player to reproduce the track and the Current Position Field to see the current cursor position). As soon as you have made up your mind what fragment to use mark the required part with the mouse in the waveform display area and it will get highlighted. 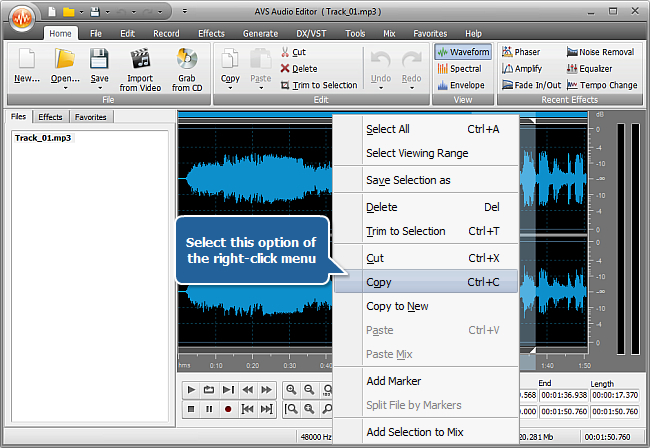 Make a right click within the waveform and choose the Copy option of the appeared menu. Put the cursor at the end of the track using the Go to Next Marker button, make a right click within the waveform and choose the Paste option of the appeared menu to add your fragment. Note: to delete any unnecessary moments of silence in the original or resulting track use the Delete Silence button placed at the Effects tab. For more detailed information on this option refer to the corresponding section of the Online Help. Click the black arrow under the Save button on the Home tab and select the Save as option to save this track with any name, location, format which can suit your needs best. 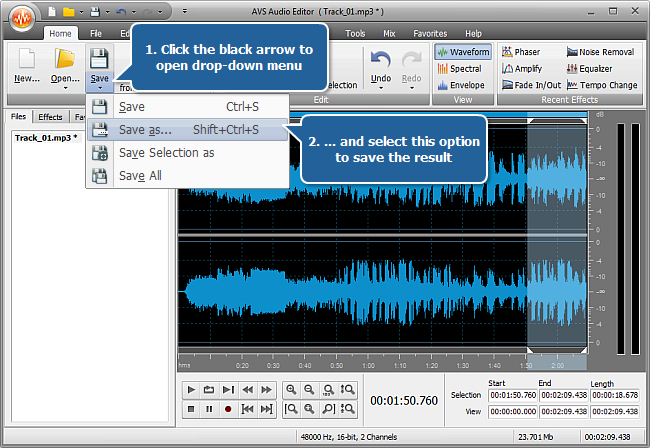 For more detailed information on the saving options of AVS Audio Editor refer to the corresponding section of the Online Help. Now when you have a track of the required duration, add it as background music to your media file using our easy-to-use AVS Video Editor.